To me, the book of Job is one of the most interesting books in the Bible. What makes it so particularly interesting is the historical time period in which the events are recorded. Job was probably born some 200 years after the flood (I personally believe he was the sixth generation from this cataclysm), and the events described in the book occurred when Job was about a 100 years old. In the very first verse, it states that Job lived in the land of Uz. In Genesis 10:23, we discover that Uz was the grandson of Shem. This was the third generation after the flood inclusive of Shem. Again, the Bible stops its side-branched genealogy with Uz in order that we may connect the dots with the story as found in the book of Job. From this same chapter, we know that the dispersion at Babel happened in the fifth generation. Undoubtedly, Uz left the area of Babel and settled in a new geographical area which would later be named after him. It stands to reason that Job descended from the lineage of Uz. In verse 3, the scriptures tell us that Job was “the greatest of all the men of the east”. It appears that he was not only esteemed by those who knew him because of his wealth, but also because of his piety. The title I have chosen reflects the fact that the book of Job contains many nuggets. A nugget is usually referring to a chunk of gold or some other precious metal, but it may also denote a valuable fact or idea. There are many nuggets of truth contained in this most revealing book. We will only consider five of these valuable gems. Creation. I suppose it appropriate that we begin with what the book of Job teaches us about the creation week. I believe God shared with Adam the accounts of that first creative week. As a result, Adam passed this knowledge down to his descendants. Noah had this knowledge, and he carried it with him to share with those living after the great flood. The word “spreadeth” means to stretch, spread out, or bend. After creating the universe, God immediately began to expand the limits or realms of his creation. This may be one facet to help us understand how we can behold stars which are now billions of light years away. The Bible states that God knows the number and the names of the stars. Undoubtedly, God told Adam the names of the visible constellations which he beheld in the night sky. In the first chapter of Genesis, it declares that God began his creation with a big sphere of water. This verse in Job describes how God walked upon the “waves” (Hebrew: heights or elevation) of the sea. Compare this with Genesis 1:2, “And the Spirit of God moved upon the face of the waters”. In this discourse of Job, he responds to his friend, Zophar, how that everyone (verse 3) has this knowledge about God being the Creator. So, even in the sixth generation after the flood, mankind was still well-versed in the creation account. So now, we find that astronomy, biology, and geology declare by their very existence the majesty of the creative power of God. The psalmist and prophet, David, reaffirmed this fact in Psalms 19:1, “The heavens declare the glory of God; and the firmament sheweth his handywork”. Because of this, Paul states that mankind is “without excuse” in Rom.1:20. Sadly, modern-day “science” fails to recognize God as the Creator, instead they believe that time and chance brought about the marvels of creation. This brief verse contains a wealth of scientific knowledge. Long before the Babylonian, the Medo-Persian, the Grecian, and the Roman empires, man had knowledge of the mysteries of the universe. Yes, ancient man knew that the earth was supported by nothing. Polaris, the Pole star, was situated near the “empty place”. However, it wasn’t until 1981 that the Bootes Void, otherwise known as the Great Void or Super Void, was discovered. This region in space is a vast empty place. It’s diameter has been estimated to be about 250 million light years. For comparison, our Milky Way galaxy is approximately 100,000 light years in diameter. These two majestic creatures were cited by God to demonstrate the awesomeness of his creative power. Notice, they were created on the same day that God made Adam. The Bible boldly states that man and dinosaurs were contemporaries. Many commentaries or reference Bibles maintain that these are the hippopotamus and crocodile, respectively. However, if a person is honest with themselves, they will recognize that the description recorded in Job does not fit neither animal. The puny tail of the hippo could hardly be described to resemble a cedar tree. Also, the crocodile fails miserably to coincide with the attributes of the leviathan. In fact, no living animal fits the narrative as found in chapters 40 and 41. Both, however, could well be recognized as some sort of dinosaurian. This assertion is quite upsetting to the evolutionist. There are many Christians who believe that God used evolution as the “vehicle” to bring about his creation. Even in the sixth generation of Job’s era, it was common knowledge that God created man. Zophar, in rebuking Job, stated that “knowest thou not this of old, since man was placed upon earth.” (Job 20:4) No, mankind did not evolve from a lower form of animal life. God created man in his own image from the dust of the ground. The Antediluvian World. The word antediluvian simply means before the flood. Besides the meager facts that we might glean from those first few chapters of Genesis, the Bible is pretty much silent with regard to the conditions of the world before and after the destructive force of sin. We have no one that we can go to answer the questions that we might have concerning this era before that universal flood of God’s judgment, but this is not the case with Job. There are several things we can learn from these passages. Obviously, those who have lived a long time have acquired wisdom and knowledge. Remember, I said that Job was about a hundred years old at the time of his troubles. Job’s father was still living at this time, yet he was deemed young as compared to others. In the last chapter of Job, it states that Job lived another four generations. This would place him at the tenth generation after the flood. The tenth generation is the generation in which Abraham is introduced to us in the scriptures. God always has a witness for each generation. Before one light goes out, God has another one ready. In Jack Cuozzo’s book, Buried Alive, he presents the hypothesis that the protruding foreheads of the Neanderthal merely represented advanced ages. This has much credence, since many of the Neanderthal remains were found in upper strata above the more “modern” human remains. This means that the Neanderthals lived longer and died after their modern contemporaries. This fits in perfectly with what the Sumerian tablets record and what we also find in the writings of the book of Job. By the way, Jack Cuozzo is a forensic dentist who has actually taken x-rays of authentic Neanderthal fossil remains. Although Noah acquired much knowledge during his life before the flood, it probably paled in comparison to the collection of facts and data that mankind had attained during those first 1700 years. Adam, no doubt, was created with a superior intellect, so mankind had a firm foundation upon which to build. There is a passage in Job which alludes to this loss of knowledge and understanding. The first clause of verse 15 refers to the creation week in Genesis 1:9. The last part of that verse, I believe, is referencing the flood. Most of man’s vast, acquired wisdom was lost and covered in a watery grave. What else does the book of Job teach us about the antediluvian world and its inhabitants? It appears that the physical world was like a giant greenhouse with a stabilized environment. The average lifespan was over 900 years, and man’s knowledge was vast. Remember, God sent the flood as a judgment upon an ungodly generation. Let’s pull back the veil a little and take a look at that last generation. Sometimes we are quick to judge Job’s friends. But because of what they had learned from their ancestors, they naturally and sincerely believed that Job was hiding some sin. Otherwise, God would not inflict such pain and torment upon him. Eliphaz is reminding Job that those who perished in the flood were guilty. Even Zophar pleaded with Job to “stretch out thine hands toward him”, in other words, repent. Yes, the antediluvians were guilty, but guilty of what? From these verses, we discover that these wicked men, although prosperous and long-lived, did not experience peace or contentment. They rejected the only One who could give them peace. Perhaps the reader noticed the strange phrase, “a dreadful sound is in his ears”. The word dreadful means “alarm or terror”. The word sound means “proclamation or a call”. The word ears denotes “to hear”. These evil antediluvians heard a proclamation that instilled terror into their hearts. This, most probably, refers to the warning of impending destruction by the preaching of Noah (2Pet.2:5). However, this “call” to repentance did not change their hearts or their lifestyle. Finally, we find mankind in open and flagrant rebellion against God. What they exhibited was an overt hatred for God. They failed to realize that the very God who they despised and rejected was the one responsible for all the material blessings which they loved and enjoyed. How very reminiscent of that mindset is the world in which we live today. This passage reveals that the antediluvians were oppressive, selfish, violent, and obsessed with material possessions. Notice the obvious allusion of these verses in Job as compared to Jesus’ words in gospel of Matthew. In Job 24, it gives a litany of sins of this wicked generation. They completely disregarded any rule of law. They had no empathy and even despised the outcasts and forsaken such as the fatherless, the widows, and the poor. They were murderers, thieves, adulterers. Yes, the world was in moral and spiritual turmoil. This was the antediluvian world. The book of Job is replete with flood references and allusions. I have already cited many of these. In Job 28:9-10, we find an interesting concept. Of course, as a biblical creationist, this fact is not new. If one accepts a world-wide flood, then the fact that the mountains and other sediment would be greatly eroded and the face of the earth would be changed. This agrees with Peter’s words in 2Peter 3:6. The world and its climate drastically changed as a result of the flood. When Noah and his family disembarked from the ark, they encountered a world which was pretty much barren. There were no forests, only some shrubs and grasses. The total topography of the world had changed: there were new rivers and new mountains. The Bible does not explain the mechanism that caused this tremendous rip in the earth’s crust. It merely states that it happened. As a result, immense torrents of rain ensued which lasted for some 40 days. Because of these subterranean waters, the flood continued to rise upon the earth for 150 days. With this immense weight of water over the cavities left by the underground fountains of water, the crust caved in causing deep water basins in which the water began to drain off the earth. God caused a wind to pass over the earth which helped in a quicker drying off of the earth’s surface. During the waning or last stages of the flood, mountain building began to occur. In science, this is known as orogeny. Because of this rift or rip of the crust of the earth, it triggered global volcanic activity. In our oceans today, we have what are known as seamounts. These are merely underwater volcanoes. Most of the islands in the world’s oceans are volcanoes which have risen above the ocean surface. However, it is estimated that there may be as many as 100,000 of these seamounts in the world’s oceans. Let’s consider the effects of all these seamounts releasing vast amounts of heat into the oceans. It would produce a mass of water vapor and ash which is unimaginable. As this vast amounts of water vapor migrated to the poles, huge snowfalls were initiated. This continued for many decades until the temperature of the oceans stabilized. This was the one and only “ice age” that planet earth has ever experienced. By this time, the reader is wondering: what has this to do with Job? Well, let’s consider another passage of scripture. I would liken the time of Job with what I remember of the 1950s. Many churches all across our beautiful land were filled with capacity on Sunday mornings. Yes, there was evil in the world, but it was thought shameful to the general public. When I was young, I considered all adults would be protective and do the right thing. Of course, this estimation was seen through the eyes of a child. My point is this: America still had an aura of innocence about her. There have been about sixty million babies aborted since 1973. No, America is no longer innocent. As a nation, we have become tolerant, and even embraced, immorality. Violence seems to have escalated to an all-time high. The “base” men are no longer driven out to the desolate regions of the earth. What does God deem important? So, let’s see what Job was instructed. Let’s find out what God desired from mankind. I’m sure the reader has noticed that what was important to God during Job’s time is important in our present age. When the lawyer asked Jesus which is the great commandment in the law, Jesus answered: love God, love man. Nothing has changed. How we act and behave toward our fellow-man is of crucial importance. I sincerely believe that we will fully comprehend this truth in the judgment. 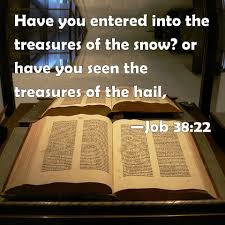 These are but four treasures found in the book of Job. There are many more. Job teaches us about the priestly role of the father; it speaks to us about faith; it tells us about the resurrection; it unveils one aspect of human suffering, and many more nuggets of truth are found within this ancient book. But, in an effort to bring us up to our present age, the book of Job discloses one more treasure that I must share. Millennials. This is not a misprint. Job does address this famous group. It is generally accepted that to qualify for this distinction of being a millennial, you must be 20 to 36 years of age. Generally speaking, the millennials have great familiarity with communications, media, and digital technologies. As a consequence, they feel that they are advanced in their knowledge and wisdom. One study showed that millennials exhibited 16% more narcissism than older adults. One aspect of this narcissistic behavior was a sense of grandiose importance. They feel that whatever they have to say should be duly noted. Well, I guess it’s time for me to reveal who represented the millennials in the book of Job. Can the reader guess who it is? Everyone is familiar with the phrase Job’s three friends. Actually, there was a fourth person who came along. In fact, he was the last to speak. His name was Elihu. The three friends spoke according to their age beginning with the eldest, Eliphaz. After all had finished speaking, Elihu spoke up. I will just quote a few statements made by this Enlightened One. Now, it is God’s turn to speak. In Job 38:2, God addresses this millennial by using Elihu’s own words against him. After this, God had no further words for this enlightened one. Although these comments about Elihu were written tongue in cheek, they still bear much truth to many of today’s millennials. I hope the reader has enjoyed this short study in Job. It has within its pages so much more than what I could ever share. I invite you to read through it thoughtfully. May God bless.